The University of Southampton is deploying a new Infoblox-based DHCP and DNS service. Underneath Infoblox is just a custom version of ISC DHCPD and ISC BIND. We also have a Windows-based WDS (Windows Deployment Services) network build server which we want to be used as the PXE build server. If you’re not using IP helpers, which most people don’t, this can be tricky. 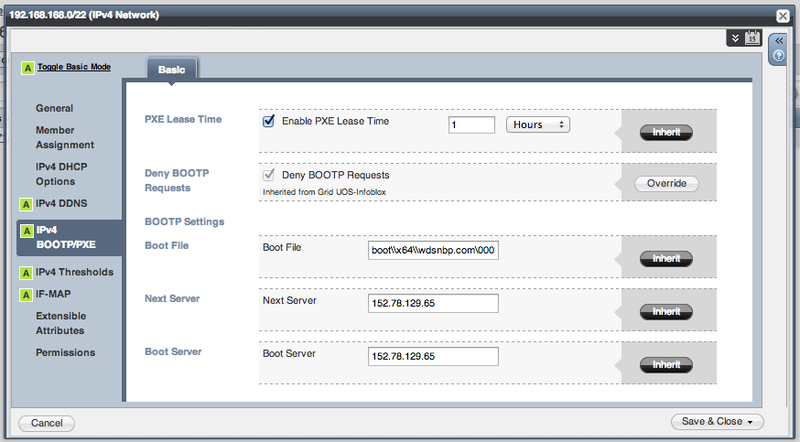 The solution is to configure the “next-server” and “pxe-boot” server IP address in Infoblox. As far as I can tell this seems to set DHCP option 66 which is the TFTP boot server IP address. However you also need to set the boot filename – which seems to be DHCP option 67. If you’re using a Linux TFTP server and syslinux/pxelinux that filename should be set to ‘pxelinux.0’. The Windows TFTP server of course requires a different path. It seems that for Windows WDS the path is ‘/boot/x86/wdsnbp.com’, except Windows uses backslashes, and just putting that path in does not work – you’ll end up with a TFTP access violation error. Instead you need to use backslashes, but escape the backslashes as ISC DHCPD will think you’re using an escape sequence. You also need to terminate the filename with a NUL character. And then, voila, you should be able to use a PXE boot client onto a Windows Deployment Services PXE server from an Infoblox DHCP server.